So, if you read the blog last Friday before 7 a.m., you’ve already read part of this post, but keep reading:). I had included some of it on my #H54F post, but then edited the post down because I thought this deserved it’s own post. I’ve always loved clothes (and shoes, bags, and accessories too)! My style is kind of eclectic–usually trendy, sometimes preppy, sometimes classy, and mostly always comfy. I enjoy mixing together different looks, and finding new ways to re-wear the same clothes. While I don’t mind spending money on wardrobe staples (like a good suit), I really don’t like spending a lot of money on trendy or fun pieces. So when end-of-season clearance comes around, I’m in clothes-buying heaven! Yes, I’m buying clothes for a season that is ending, but the trick is to buy pieces that you can work into your wardrobe all year long! 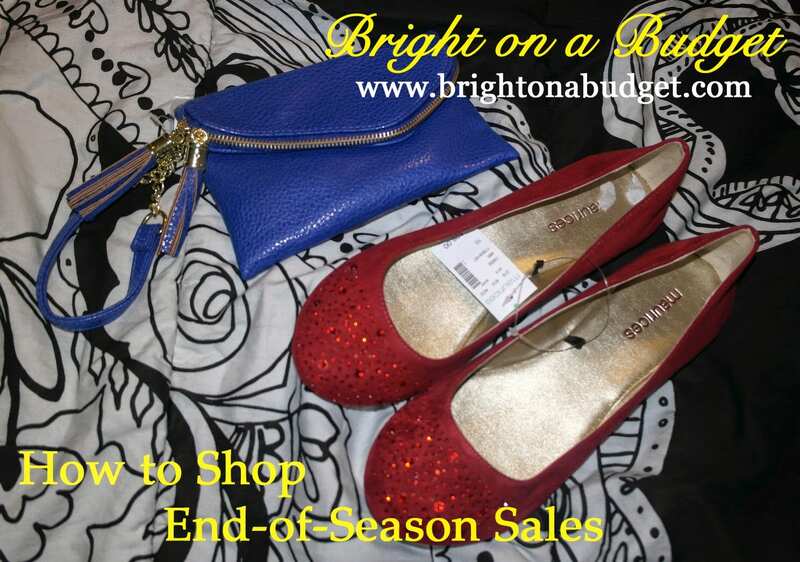 Online haul from Maurices–see bottom of post for details on how to save even more! 18 items for only $100.85! 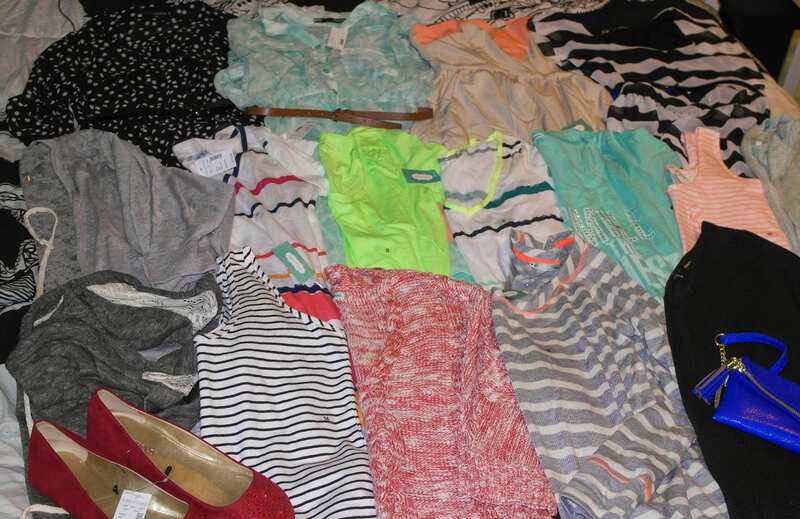 I saved $347.79!4 dresses, 2 cardigans, 2 tanks, 4 tees, 2 sweaters, 2 shirts, 1 pair of flats, and 1 wristlet. 1. Set a budget and price points. While these shopping trips usually yield some amazing finds, treat it like any other shopping trip. Set limits for how much you’ll spend total and what your price points are for certain articles of clothing. My limits at an EOSS? $15 for pants and blazers, $10 for cardigans and shirts, and $15 for shoes. Accessories are more flexible and I use my best judgment on value. 2. Step outside your wardrobe comfort zone! I like to pick up my trendy pieces at EOSS. That way I’m able to work trendy pieces into my wardrobe without agonizing over whether the price is worth the wear I’ll get out of it. I always try on most of the clothes that’s in my size, even stuff I wouldn’t normally try on, just to see what I think about it. 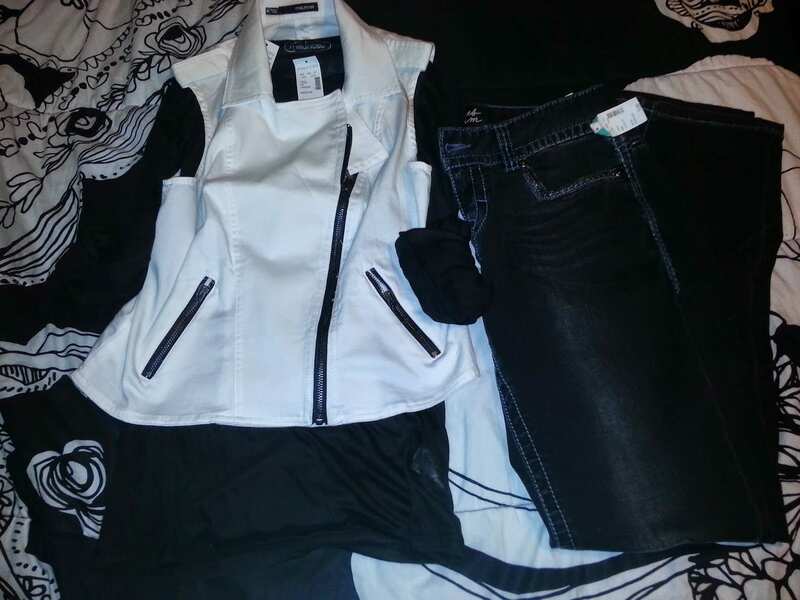 For instance, I scored the sweet moto vest pictured below for $8.74, and the black skinny jeans for $14.75. I have shied away from the moto vest/jacket trend, as well as black jeans, but I really liked both trends when I tried them on! 3. Don’t limit yourself into think that EOSS items can’t be worn in other seasons! The peplum top above is a sleeveless shirt, but I can’t wait to wear it this winter with the long-sleeved tee under it when I need a pop of color! Any tees or tanks can be paired with a jacket or cardigan for cold-weather wear, and even short-sleeved cardigans can be paired with a long tee! Summer dresses look adorable in the winter with chunky cardigans, textured tights, and boots or flats. 4. Stock up on staples. I picked up several plain tees because those are wardrobe staples. You can never go wrong with adding some simples tees and tanks, neutral cardigans, or new jeans. I know I’ll need these things at some point during the year, and I’d much rather grab them at lower prices. Seriously, when was the last time a plain white tee went out of style?! 5. Don’t overlook shoes and accessories! I think sometimes people get so focused on clothes shopping that they forget that EOSS also includes shoes and accessories. 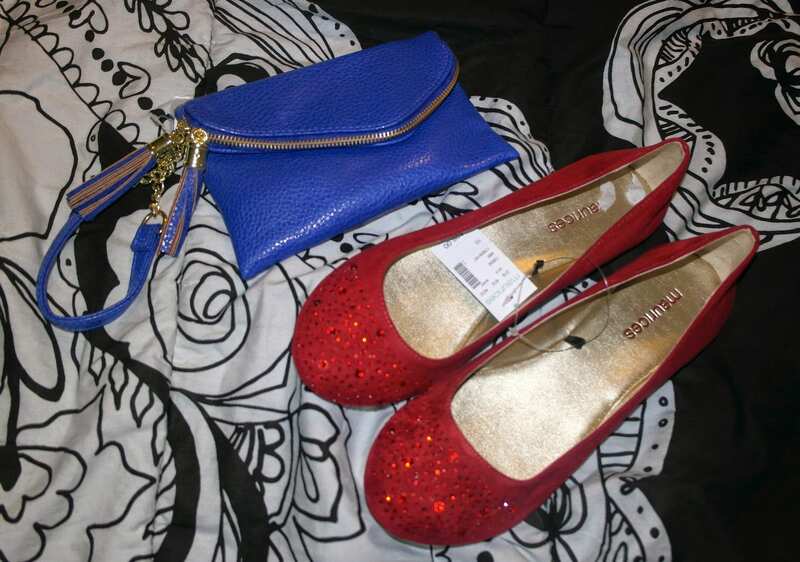 Check out these cute flats (ok, ruby red slippers) that were less than $5 and the adorable wristlet I scored for $2.92! 6. Look for additional savings via coupons. Check Retail Me Not and Coupon Sherpa to see if you can find any additional printable coupons (for in-store) or promo codes (for online) to save even more! Ready to shop? Good. All the clothes featured in this post came from Maurices, which is one of my all-time-favorite stores! Maurices, like many places, has started their end-of-summer final clearance. This is my absolute favorite sale of the year–yes, even better than Black Friday! All of their final clearance is an extra 75% off the lowest price, which means shirts for as low as $3.24 and shoes for under $5. If you don’t have a Maurices nearby, you can shop online. Use code RMN714 for an additional 10% off sitewide + free shipping over $50 (code expires 07/31/14)! Don’t forget to use Ebates for an additional 3.5% back on your purchase. In-store haul. 24 items for only $171.26! I saved $505.01! 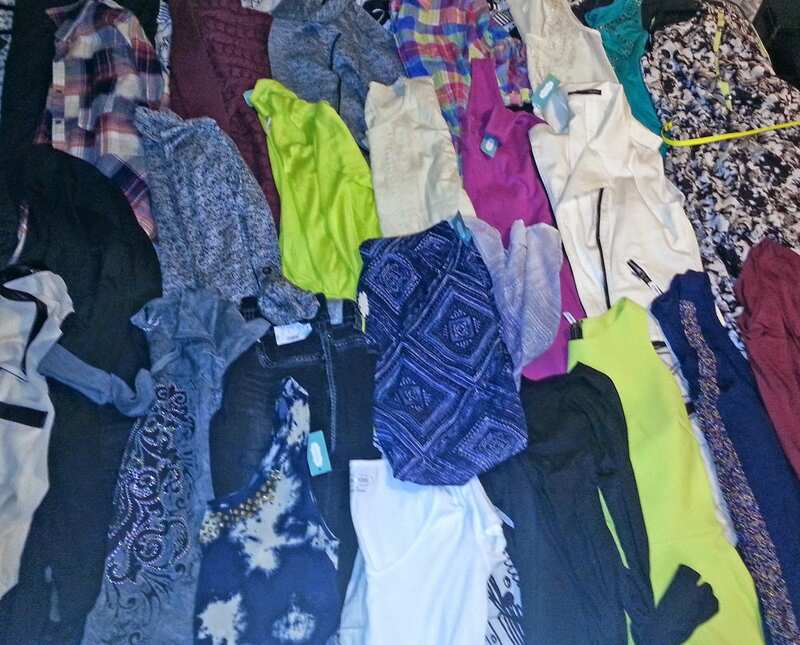 1 pair of skinny jeans, 1 skirt, 1 dress, 3 cardigans, 1 blazer, 1 jacket, 1 moto vest, and 15 shirts (1 shirt not pictured)! I love to find a bargain! I love Talbots and their extra 60% off markdowns was way too good to pass up. I got a shirt for $9! That's awesome! I never go into Talbots but clearly I need to start!